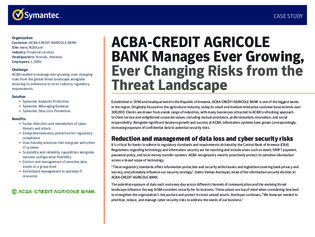 ACBA-Credit Agricole Bank recognized a need to proactively protect its sensitive information across a broad scope of technologies. In order to do this, they needed a centralized solution to increase efficiency and ensure threat detection and remediation happened quickly. ACBA deployed Symantec Endpoint Protection which they also integrated with Symantec Messaging Gateway and Symantec Loss Prevention. These solutions have helped them implement a stable and reliable supervisory system in the IT environment.